08/07/2012: A year after the NFL moved up kickoffs by five yards, a study by the consulting firm Edgeworth Dynamics finds that the changes led to a 43 percent drop in the number of concussions reported during kickoffs from 2010 to 2011. Kickoffs are one of the more chaotic and dangerous plays in football. 09/05/2012: The NFL donates $30 million to the National Institutes of Health (NIH) for brain injury research. The unrestricted gift is the single-largest donation in league history. In the league’s press release announcing the gift, it points to chronic traumatic encephalopathy as one possible area of research. CTE, as the condition is known, is a degenerative brain condition associated with repeated head trauma. It can lead to dementia, memory loss, and depression, and has been documented in the brains of 50 deceased football players. 09/16/2012: New York Jets running back Shonn Greene is blasted on an illegal helmet-to-helmet hit by Steelers safety Ryan Mundy. Greene returns to the huddle, dazed and wobbly, until quarterback Mark Sanchez effectively removes him from the game by pushing him to the sidelines. After a series of concussion tests in the locker room — which Jets officials say Greene passed — he is given the green light to return. Greene later says he does not remember Sanchez pushing him from the huddle. “I think what it was, when it first happened, I kind of got up too fast from the hit. I wasn’t all the way there. It was kind of shaky,” Greene tells ESPN. The NFL’s Standardized Concussion Assessment Tool (pdf) lists six “obvious signs of disqualification” from play. They include confusion and amnesia. 09/30/2012: Detroit Lions receiver Calvin Johnson takes a helmet-to-helmet hit from Minnesota Vikings linebacker Chad Greenway. Johnson is tested for a concussion, but returns to the game about six minutes later. When the Lions return from a bye week after the Vikings game, Johnson is not listed on the injury report. 09/30/2012: Jacksonville Jaguars receiver Laurent Robinson sustains his second concussion in as many weeks, and his third since the start of NFL training camp in July. 10/07/2012: Matt Cassel suffers a concussion after being hammered by Haloti Ngata of the Baltimore Ravens. Fans cheer as the struggling Kansas City Chiefs quarterback lay motionless on the field for several minutes after the hit. (Watch the hit here). We are athletes. We are not gladiators. This is not the Roman Coliseum … There are long lasting ramifications to the game we play, long lasting ramifications to the game we play. I’ve already kind of come to the understanding I probably won’t live as long because I play this game and that’s OK, that’s the choice I’ve made. That’s a choice all of us has made. But when you cheer somebody getting knocked out, I don’t care who it is, and it just so happened to be Matt Cassel — it’s sickening. It’s 100 percent sickening. 10/14/2012: Washington Redskins safety Jordan Pugh exits a game against the Vikings twice in one quarter with a head injury. Pugh’s first injury comes with roughly four minutes left in the game. He is back on the field with 2:30 left on the clock after being cleared by the Redskins, according to the Associated Press, but is down again within 90 seconds. Following his second exit, Pugh is diagnosed with a head injury. Pugh is listed on the team injury report the following week with a head injury, but does not miss any playing time. “Clubs are required to provide accurate and timely injury information during games,” the NFL said in a statement. 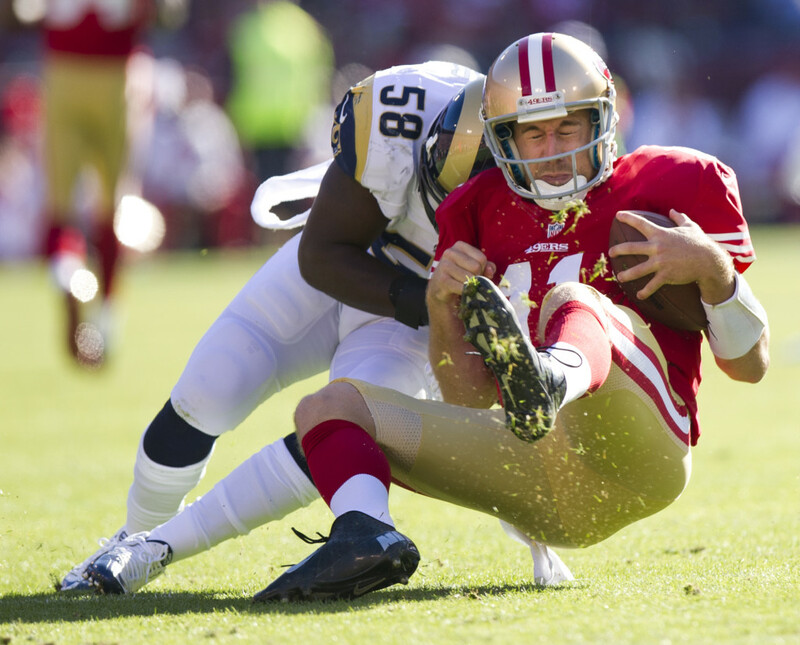 11/11/2012: Ten games into his most successful NFL season to date, San Francisco 49ers quarterback Alex Smith suffers a concussion against the St. Louis Rams. He stays in the game briefly, and despite a case of blurred vision, connects with receiver Michael Crabtree six plays later for a touchdown. Smith is replaced by Colin Kaepernick, who goes on to permanently take over the quarterback position for the 49ers. Critics say coach Jim Harbaugh’s decision to stick with Kaepernick even after Smith returned to full health will only make players more reluctant to report head injuries. “I feel like the only thing I did to lose my job was get a concussion,” Smith later says. 11/11/2012: Three starting quarterbacks — Jay Cutler of the Chicago Bears, Michael Vick of the Philadelphia Eagles, and the 49ers’ Alex Smith — leave games with head injuries. The NFL Players Association (NFLPA) responds by saying it will renew its call for independent neurologists on the sidelines of every NFL game. Independent experts on the sidelines would make the situation worse, unless they had a baseline exam on each player … No one knows the players as well as the athletic trainers, period. 11/16/2012: A joint investigation between FRONTLINE and ESPN finds the NFL’s retirement board awarded disability payments to at least three former players after determining football caused their brain injuries. The payments stand out because they came during a period in which the league’s top medical experts denied any link between professional football and long-term brain damage. 11/22/2012 – 11/26/2012: Nineteen players exit games with either a concussion or head injury during Week 12, the most of any week of the season. 12/03/2012: Researchers at Boston University announce they’ve discovered 28 new cases of CTE in deceased football players, including 15 who played in the NFL. The discovery more than doubles the number of documented cases connecting football to long-term brain disease. If you want to prevent concussions, take the helmet off: Play old-school football with the leather helmets, no facemask … When you put a helmet on you’re going to use it as a weapon, just like you use shoulder pads as a weapon. 12/17/2012: Commissioner Roger Goodell floats the idea of eliminating kickoffs altogether during an interview in the Dec. 17 issue of Time. 12/27/2012: New York Jets coach Rex Ryan tells reporters that third-string quarterback Greg McElroy — who just four days earlier was elevated to starter — hid concussion symptoms from the team’s medical staff. Several players tell ESPN that while trainers may not have known about McElroy’s symptoms, teammates did. “He definitely has that [warrior] mentality, but it got to the point where it was scaring him,” said left guard Matt Slauson, who was aware of McElroy’s condition. 01/07/2013: A study of 34 former NFL players by researchers at the University of Texas finds depression and cognitive damage is more prevalent among ex-players than in the general population. At the same time, researchers found no evidence of cognitive impairment in the majority of players in the study. 01/10/2013: The NIH says an examination of Junior Seau’s brain showed the former NFL linebacker suffered from CTE at the time of his suicide in May 2011 after more than 20 seasons in the league. 01/22/2013: Brain scans performed on five former NFL players reveal traces of the protein that causes CTE. The landmark study by researchers at UCLA marks the first time signs of the crippling disease have been identified among living players. 01/23/2013: Junior Seau’s family files a wrongful death lawsuit against the NFL, claiming the linebacker’s suicide was caused by head trauma he sustained over his 20 years in professional football. The lawsuit alleges the NFL deliberately hid from players the dangers of repetitive blows to the head. 01/25/2013: Ravens safety Bernard Pollard tells CBS Sports that the NFL’s renewed emphasis on player safety is threatening the league’s future. I’m a big football fan, but I have to tell you if I had a son, I’d have to think long and hard before I let him play football. And I think that those of us who love the sport are going to have to wrestle with the fact that it will probably change gradually to try to reduce some of the violence. In some cases, that may make it a little bit less exciting, but it will be a whole lot better for the players, and those of us who are fans maybe won’t have to examine our consciences quite as much. 01/29/2013: The NFLPA announces it will partner with Harvard University for a 10-year, $100 million study of 1,000 retired players. The study will focus, in part, on repetitive blows to the head and how they contribute to CTE. Research will also look beyond head trauma to examine everything from knee ligaments and heart function to psychological stress and the effects of long-term exposure to painkillers. 01/31/2013: The same day that the NFLPA reveals a survey that finds four in five NFL players do not trust their team’s medical staff, the NFL’s general counsel, Jeff Pash, says the league expects to have independent neurologists on the sidelines next season to help diagnose concussions.